FOR IMMEDIATE RELEASE – March 2, 2012 – Binghamton, NY – SunMaxx Solar, a leading, vertically integrated manufacturer of solar thermal systems and components, is pleased to announce that the solar industry leader has launched a custom Glycol XT. 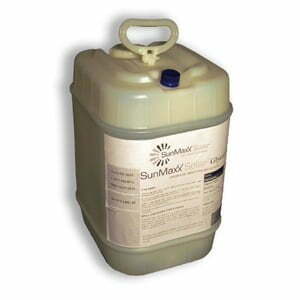 SunMaxx Solar’s custom solar-formula Glycol XT is a 50/50 mixture of 1,3-Propanediol and water. With a long list of advantages, including a lower price, this heat transfer fluid has a higher thermal conductivity than standard propylene glycol, while maintaining the original’s very low toxicity. SunMaxx Glycol XT also has a greater temperature range than standard propylene glycol. It can go just as low without freezing to -17°F (-27°C), and can withstand temperatures as high as 349°F (176°C) without breaking down. In addition to all its other good features, Glycol XT is also a very green product. Unlike typical propylene or ethylene glycols, which are made from foreign oil or natural gas, SunMaxx Solar Glycol XT is made from sustainable, bio-based raw materials. And production emits 40% less green house gas and uses 20% less energy to produce than standard propylene glycol. SunMaxx Solar Glycol XT is proudly made in the U.S.A. and, best of all, it’s 100% renewable. For more information contact marketing@sunmaxxsolar.com.